Spanish version of the full-length SIA publication now available. UPDATED: Check out the Spanish version of this document: Descargue la Guía de Evaluación de Impacto Social. 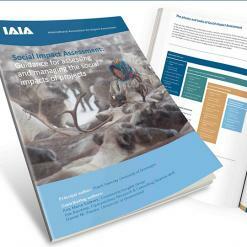 Download this new IAIA publication today: Social Impact Assessment: Guidance for assessing and managing the social impacts of projects. The purpose of this Guidance Note is to provide advice to various stakeholders about what is expected in good practice social impact assessment (SIA) and social impact management processes, especially in relation to project development. Special thanks to principal author Frank Vanclay (University of Groningen) and contributing authors Ana Maria Esteves (Community Insights Group), Ilse Aucamp (Equispectives Research & Consulting Services), and Daniel M. Franks (University of Queensland). Want more publications like this? Check out the Resources section of our website for lots more IAIA documents and resources.